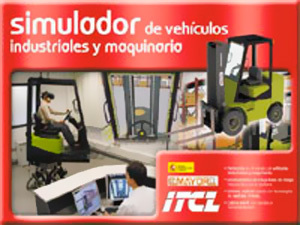 Research project “Simulator for training fork lift truck and load handling machinery operators” carried out in the Instituto Tecnológico de Castilla y León (Castilla and Leon Institute of Technology) (ITCL), in collaboration with Carretillas Mayor S.A., as part of the Programme for Fostering Technical Research (in Spanish, PROFIT) of the Ministry of Industry, Tourism and Commerce (in Spanish, MITYC). Visualisation through a virtual reality helmet. The option to follow student head movements through 6DoF. Sensorized cabin with real time data capture. Required areas for development: virtual reality, infographics, IT applications, hydraulics, mechanics and electronics.